Seven of the world's leading chip makers are collaborating on chips which contain transistors with features just 32 billionths of a metre wide. IBM, Toshiba, AMD, Samsung, Chartered, Infineon and Freescale have formed the alliance to cut development costs. More transistors on a chip equals more processing power, but the development process is highly expensive. Analyst Malcolm Penn of Future Horizons said the alliance was an example of "pre-competitive collaboration". Mr Penn said: "The industry needs a huge amount of money to reinvent itself every two years." He likened the cost of building a new chip factory to buying a fleet of more than 12 A380 Super Jumbos. The seven companies have agreed to work through 2010 to design, develop and produce the chips using tiny circuitry. 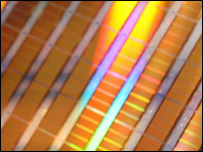 Chips built using the 32-nm process can have more than one billion transistors on them. The group's chips could be used in everything from memory, computers, graphics cards, set-top boxes to games consoles. Intel, the world's biggest supplier of chips to the computer industry, is not part of the alliance. Mr Penn said: "Intel is in a very focused market place; it really only makes chips for PCs. It's a contained market with very, very little competition so Intel's absence in this alliance is not important." Mark Bohr, Intel Senior Fellow and Director of Process Architecture and Integration, said the need for the alliance showed what a giant undertaking the roll out of new chip technology was. He said a new fabrication plant to produce the chips could cost $3bn and that Intel would be building three in order to meet demand. Despite the huge costs, he said Intel was able to go it alone. "Not only can we do it, it gives us an advantage," he told BBC News. "We don't have to deal with the co-ordination issues that the alliance will. We are able to lead the way with the technology." The alliance will focus on sharing the cost of developing the building blocks of the 32-nanometre chips. Mr Penn said: "This is about sharing the basic development of the recipe for the chips. Those building blocks are then put together by the separate companies in a fiercely competitive way."